Do more than just view an image. Touch it. Control it. 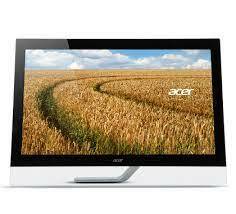 Interact with it using Acer’s advanced T2 Series monitors. Multi-touch, WQHD resolution1 and great digital connectivity are brought together with style to provide the ultimate touch experience. Plus, an ergonomic design lets you navigate in complete comfort. Colours stay true no matter what angle you’re viewing from. Share what’s on your screen with friends and family.